Wings N' Flying Things: Some times you should just stay home in bed! Some times you should just stay home in bed! My wish, as expressed last week, was for all the supplies to turn up and then to catch up with some building. Yeah well my wish came true! the balsa turned up, the glue appeared on the shelves and so did the Oracote. Oh joy!! So of course a huge flurry of building and soon balsa dust and shavings were hurtling in all directions. Then - while busily using a balsa plane to shape some cowling bits I noticed the blade was a bit on the dull side. No worries - I have spares - SO - firmly grasping the plane in one hand and inserting new blade with the other what happened? I slipped of course and instinct when you are about to drop something is to grasp at it. I did - result - balsa plane hit the floor and I was left firmly holding onto a new, razor sharp, double sided blade in the other hand. Yes dear reader - there was a bit of blood and a trip to the after hours surgery was called for. Not to bad - lacerated thumb and index finger and a cut to the palm which required 3 stitches. Fine - OK - back to the building board. 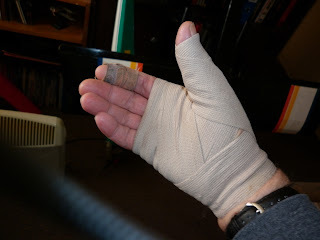 Then two days later the bloody hand swelled up like a balloon - back to the Doctor - Ummm - yes Mick - it's infected - this little jab won't hurt but we will have to stick a drain in there and you shouldn't use the hand for about a week. Have you ever found yourself with only one hand and discovered the number of things you CAN'T do????? You CAN'T hold a sheet of balsa and use a balsa stripper, you CAN'T use a bloody Transmitter, you CAN'T use a knife and fork, you CAN'T even tie your own bloody shoe laces!!! Even typing this post is slower than my usual peck, peck, peck rate. Oh well I've caught up with some reading, a few TV programs and how to eat lots of soup. The bandage comes off on Monday so hopefully next week I'll be able to report some progress.